A community choir based in Blackburn, Lancashire. We welcome anyone who simply enjoys singing. Maelstrom is our All Male Acapella Group. Under the leadership of our musical director, Jeff Borradaile, we sing an exciting range of songs, all a cappella. No audition! We perform to a high standard at events throughout the year, and welcome experienced singers to become involved and encourage those who may be new to choral singing. We meet on the second and fourth Monday of every month 7.00 pm – 9.15 pm. 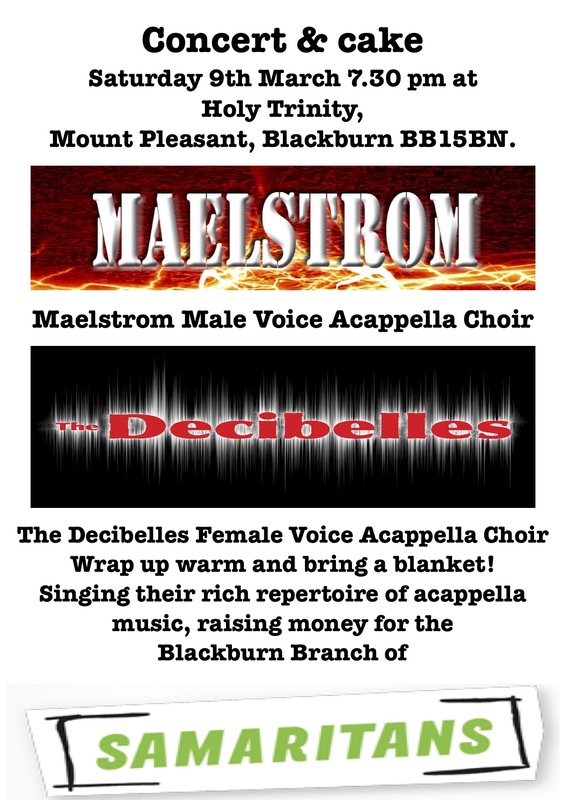 Decibelles and Maelstrom will be raising money for the Blackburn branch of Samaritans. Come and support them on Saturday 9th March. Candelight concert with plenty of cake. Wrap up warm! Come and join the main choir for a day of singing in support of Methodist Action North West. Our musical director Jeff Borradaile will be leading an afternoon workshop which is open to anyone who wants to have a fun day and willing to 'have a go'. The choir will then be performing an evening concert, joined by the workshop singers to show the fruits of their afternoon. Workshop 2.15 - 5.30pm. Concert starts at 7.30pm. Workshop and concert costs £12. Concert only £8. Please book using this form. 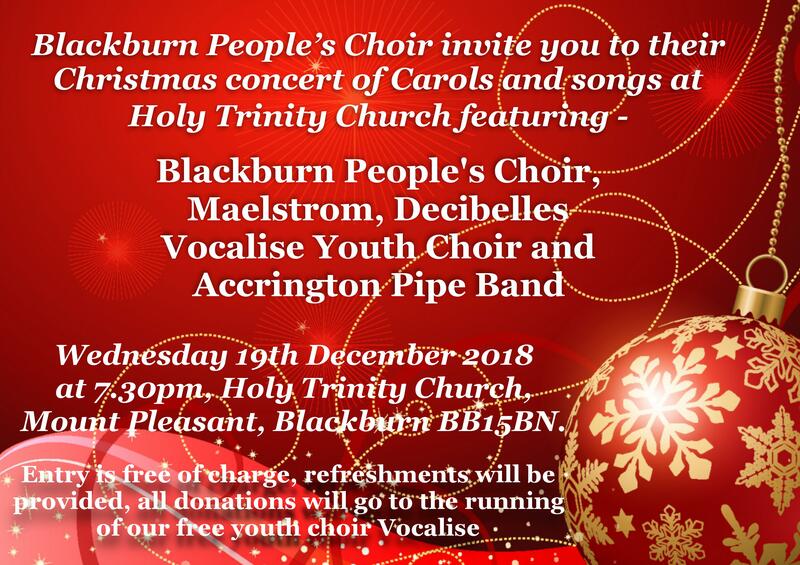 Our Christmas concert takes place on Wednesday 19th December at Holy Trinity Church. A rare opportunity to see all 4 of our choirs performing on the same night. We will also joined by the Accrington Pipe Band. What better way to head into Christmas? Grab your blankets and santa hats for a fantastic night of singing! Retro Workshop – Singing Old Songs: for all Jeff’s choirs, 10.00 am – 3.30 pm, Brockholes Nature Reserve, Preston New Rd, Samlesbury, PR5 0AG. A few select pictures from the choirs visit to Fountains Abbey in support of Ordsall Acapella Singers.